When I started this blog four and a half years ago my very first pro cyclist interview was with Australian Bridie O’Donnell. Bridie’s recently hit the headlines by breaking the hour record on the track in Adelaide so I thought it was timely to catch up with her. Q: Firstly, huge congratulations on breaking the hour record on the track recently. Was it the hardest physical challenge you’ve ever taken on? 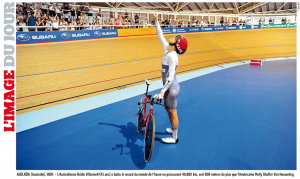 Q: How much training/preparation went into the hour record? A: A lot! Every single training session since July was directed towards the Hour and countless emails, meetings, conversations, scrabbling for sponsors, massage, physio, sports psych and travel hours! Q: When we last spoke you were racing in Italy for a European team, who do you race for currently? Q: Four years ago it seemed that your cycling career was a higher priority that your medical career, has that now flipped around for you? A: I think medicine and riding are about equal, but only one pays the bills. Q: How many hours training (when you’re not training for the hour record) do you manage to fit into your week? Are you always focused on training or do you ride for fun as well? A: I don’t ride a lot of kms, only ~15h a week of training. But I commute to and from work on my single speed town bike too. Q: How do you think we can encourage more women to ride bikes? A: The more frequently you ride, the more you realise it’s often easier, faster and more fun than using other forms of transport! Try committing to work on bike paths, ask your colleagues who ride how / where they ride; find women of similar ability or with a little more experience and ask to join them! Q: I’ve always enjoyed reading the articles that you’ve written, do you see writing as another career opportunity? A: I write a lot, it helps me clear my head and get my message across. But communication in general is what I love, and my job as a Physician gives me an opportunity to help people change their behaviour to be more healthy, so that’s very important to me.